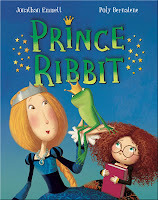 Prince Ribbit, my latest picture book with the wonderfully talented Argentinian illustrator Poly Bernatene, has just been published in UK hardback and paperback. Prince Ribbit’s heroine, Princess Martha finds inspiration in the Royal Library. 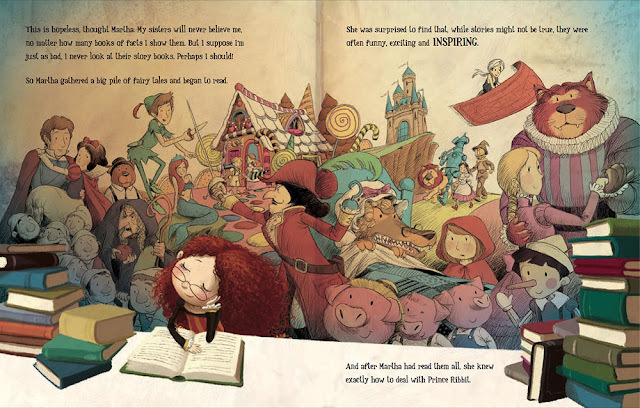 Although Prince Ribbit is the fourth book that Poly and I have done together, it’s really a follow up to our second, The Princess and the Pig, in that both stories are set in a fairytale world populated by characters who love books. 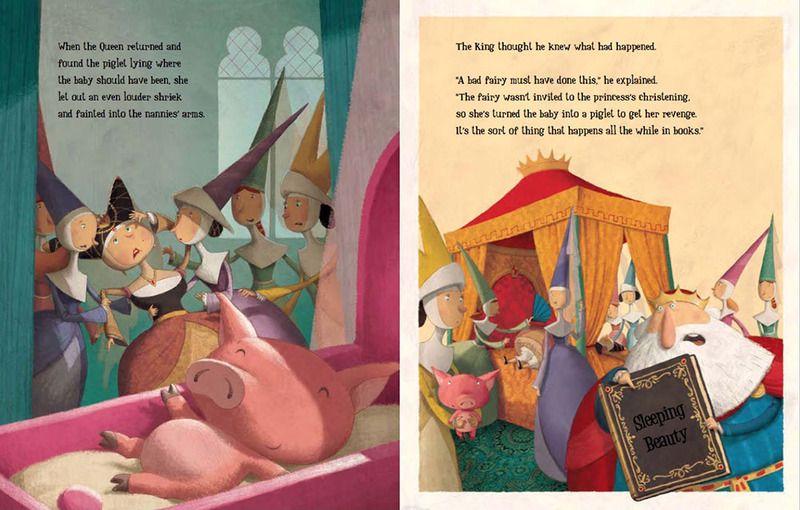 The characters in The Princess and the Pig use the books they’re reading to interpret (usually mistakenly) what's happening to them in the the story. As a book-lover myself, I’ve aways enjoyed reading stories about other bibliophiles. There’s something satisfyingly meta about reading a book about a character who is reading a book. 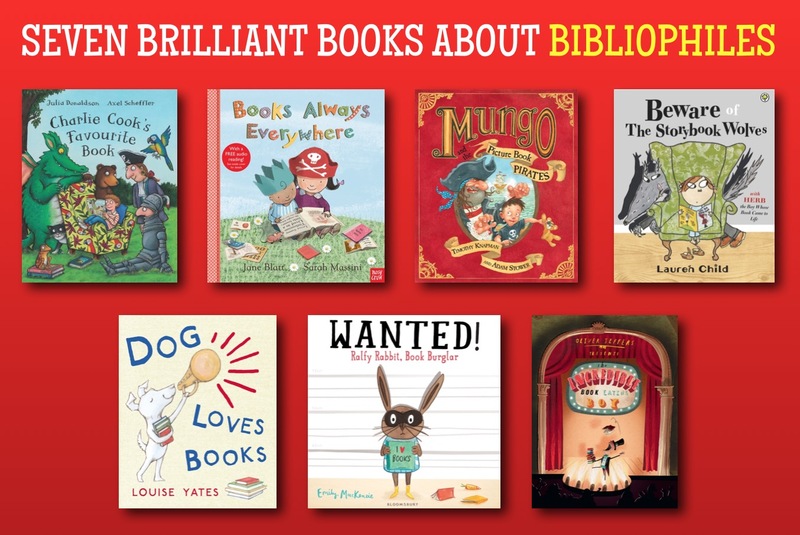 So here are seven brilliant picture books about bibliophiles. One of my favourite novels of recent years is David Mitchell’s Cloud Atlas which is effectively six books nested inside each other like a set of Russian dolls. Each book jumps forward in time and one of the ingenious connections between the stories is that characters featured in the inner books are reading the outer books. Julia Donaldson and Axel Scheffler’s Charlie Cook’s Favourite Book does something similar in picture book format. Each spread introduces a new character who is reading their favourite book, the inside of which is shown on the next spread. 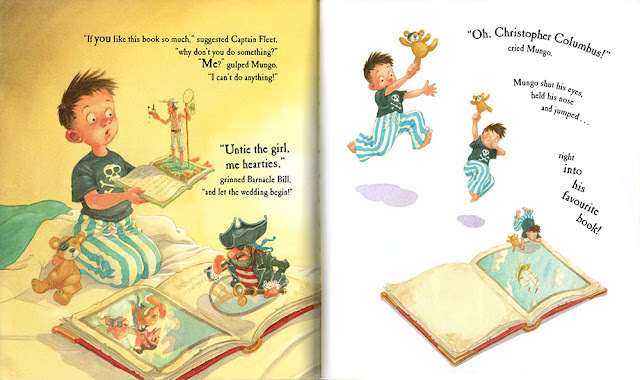 So the book starts with eponymous Charlie, who is reading a book about a pirate, who is reading a book of fairy tales, and so on. 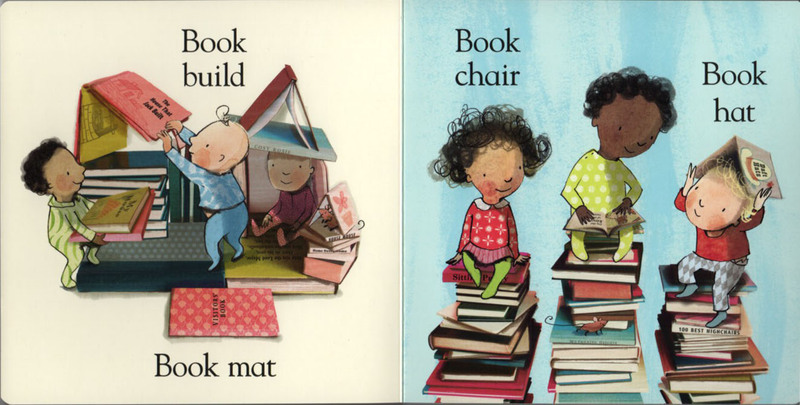 While Scheffler's spread layouts shift around as the reader jumps from genre to genre, Donaldson ties the whole bookshelf together with her perfectly-scanning rhyme. The spread from Joust Joking, Sir Percy the knight’s favourite book. Jane Blatt and Sarah Massini’s Books Always Everywhere features a diverse group of toddlers enjoying an equally diverse selection of books. Blatt’s simple but charming rhyming text combines beautifully with Massini’s cheerful, perfectly-composed illustrations to make this book an ideal gift for budding bibliophiles, especially in the board book edition. Published in 2013, this book deserves to become a pre-school classic. Timothy Knapman and Adam Stower’s Mungo and the Picture Book Pirates is one of three books in which young Mungo literally enters into the book he is reading to join in with the adventure. In this first outing Captain Fleet, hero of Mungo’s favourite pirate picture book, is so worn out after six back-to-back readings of his story, that he abandons his book leaving Mungo to take his place and rescue Admiral Mainbrace and cabin girl Nora from a crew of dastardly pirates. The second book in the series, Mungo and the Spiders from Space, was featured in one of my earlier PBD posts. With the hero holidaying in another book, Mungo is obliged to take his place in the story. In Lauren Child’s Beware of Storybook Wolves the traffic is going the other way, with characters leaving little Herb’s favourite bedtime book to join him in the real world. Published in 2000 (before many publishers developed their current anorexic obsession with diminished word counts) Child’s quirky, characterful 1,300 word text is accompanied by equally quirky and characterful illustrations in which a trio of villains (two hungry wolves and a wicked fairy) emerge to threaten poor Herb before being seen off by a fairy godmother. When Herb’s mother leaves a book behind one night, he finds himself at the mercy of two hungry wolves. 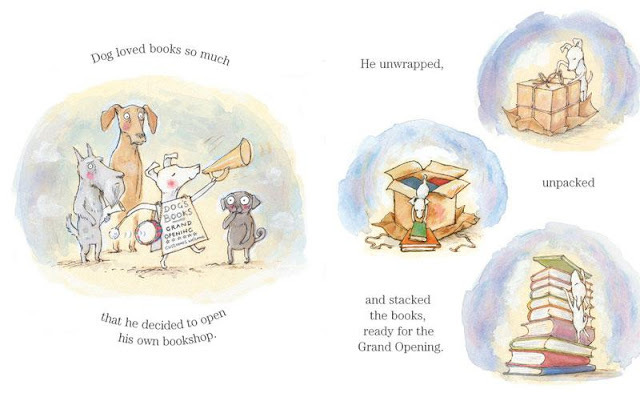 Dog Loves Books by Louise Yates sees Dog pursuing the dream of many a bibliophile – opening their own bookshop! Sadly, the bookshop's "grand opening" is a disappointing anti-climax. However Dog is able to find solace in his stock until trade picks up. You can watch Alison Steadman reading the book here. Dog shows his love of books by opening his own bookshop. 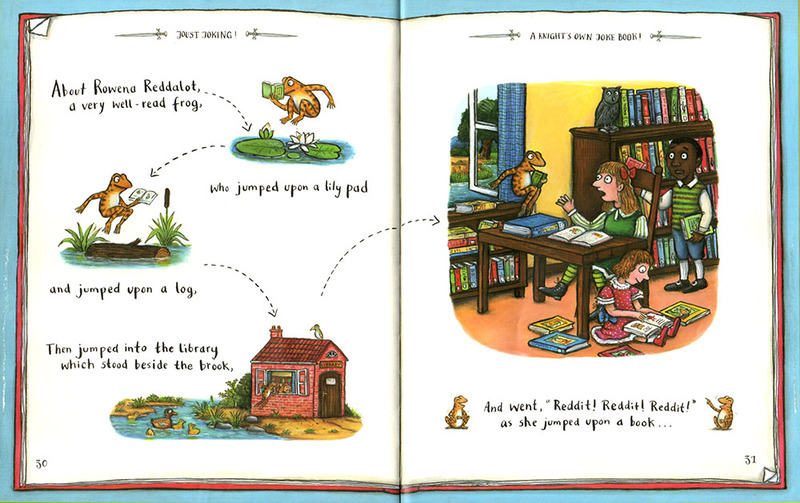 Ralfy Rabbit loves books so much, he ends up stealing them to feed his insatiable reading habit in WANTED! Ralfy Rabbit Book Burgular by Emily MacKenzie. But Ralfy’s book-burglaring days come to an end when young Arthur spots Ralfy making off with a favourite book. Ralfy Rabbit’s love of books puts him on the wrong side of the law. Henry, the title character of Oliver Jeffers’s The Incredible Book Eating Boy also has an insatiable appetite for books – only he likes to eat rather than read them. The more he eats, the smarter he gets. Eventually the strain on his digestive system proves too much and Henry finds a more conventional way to feed his love of literature. Henry’s bibliophilia manifests itself in a rather unusual way. 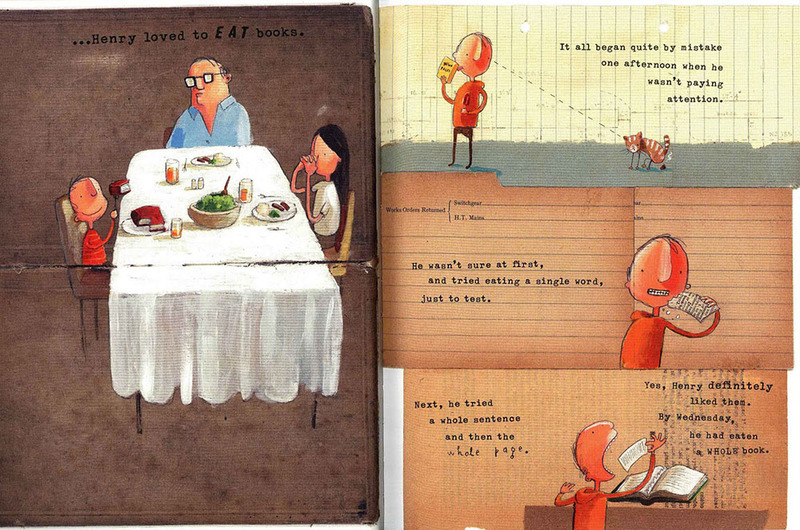 I hope this post has whetted your own appetite for some bibliophilic picture books! If you have a favourite picture book about a book-lover that I haven’t mentioned, I’d love to hear about it in the comments section below. Jonathan Emmett's latest picture book about bibliophiles is Prince Ribbit, illustrated by Poly Bernatene and published by Macmillan Children's Books. Thanks, Jonathan. I also enjoy reading books about people enjoying books. I had an option fee on one of my own a long time ago. I keep meaning to go back to the manuscript and edit it -and now you've given me the jolt I need. Thank you, and good luck with Prince Ribbit. Thanks, Clare. Alway happy to give fellow writers a jolt (in the nicest possible way). Good luck with your own bibliophile book. I love the look of your new book, Jonathan. It looks filled with absorbing detail, and I am looking forward to reading it. A great selection of other books here, too. 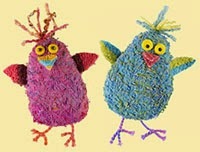 I'm going to Facebook it on my personal page as I know several parents who will be very grateful for your info! Thanks, Moira. Poly has a great knack for amusing detail. It's a pleasure to be working with him. And Thank's for posting on FB too! Lovely stuff! 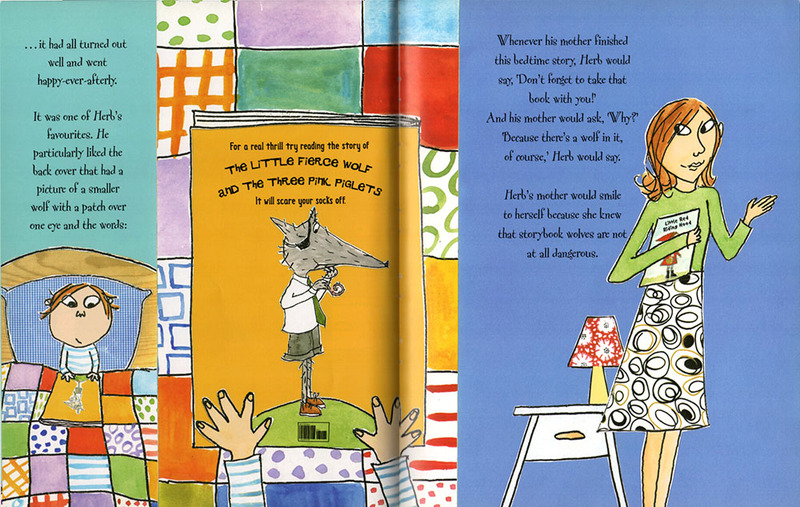 Do you know 'This Book Belongs to Aye-Aye' by Richard Byrne? Little Aye-Aye wants to be in a picture book. It's also a good story for those starting school because it tackles problems with other (animal) children, but all in a fun way. Thanks for the suggestion, Pippa. I haven't read 'This Book Belongs to Aye-Aye'. Or "The Snatchabook" and "The Knight Who Wouldn't Fight" by Helen and Thomas Docherty, which Mélanie McGilloway has just suggested on Facebook. Prince Ribbit looks a lot of fun, Jonathan, best of luck with it. I own a book called 'Castle of Books' by Bernard Clavel which I bought because I love bibliophile books, too. A kid builds a castle with books while his dad is absorbed in writing a poem. Thanks Michelle, another one for me to look out for. Mélanie McGilloway has a great list of 'Picture books about reading, books and libraries' at http://librarymice.com/picture-books-about-reading-books-and-libraries/ including 'The Fantastic Flying Books of Mr Morris Lessmore' which is another favourite of mine, so I'm kicking myself for not including it in this post. I enjoyed reading this post Jonathan and I look forward to reading your new book. I would also add Caryl Hart and Sarah Warburton's The Princess and the Giant to your list. Thanks, Catherine, and thanks for the recommendations too.